We are very lucky to come from a long line of agricultural workers and gardeners, surrounded by the countryside and country life, situated in a small village in Hampshire. Having spent all our lives living in the same village we are country through and through. We love the simple things; home grown veg, wild flowers, freshly baked bread and the great outdoors. That is where we get most of our inspiration from, the textures and tones of the natural elements show through our designs and products. We want to get back to basics, back to a time when quality prevailed and things were not only made to last, but looked great too. Being gardeners ourselves we are in constant battle with the pests and foes faced on the allotment as well as the failures and successes of our crops. Over the years we have upcycled and designed products which suit our needs and the needs of all gardeners, items which make gardening that little bit easier. 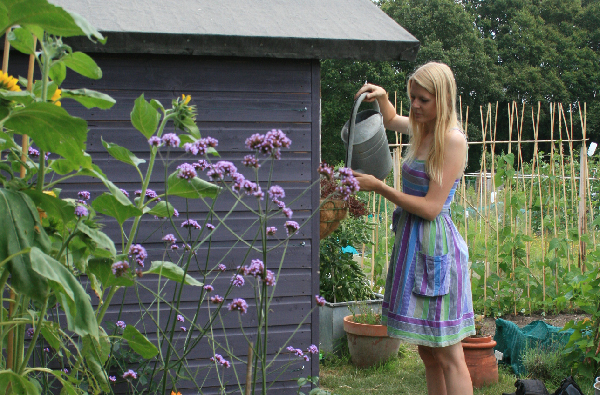 Katie’s love of gardening grew from helping her Father on his allotment and has since moved on to owning her very own patch of land. You will often find her amongst the flowers talking to the frogs in the pond, when she’s not there she will busy at home making things on her sewing machine. Another talent passed down through the generations, she learnt to sew on her late grandmothers sewing machine and has been hooked ever since. A lover of the 1940’s, animals, wild berries and long walks. She is most at home with her hands in the soil, flowers in her hair and chickens at her feet. 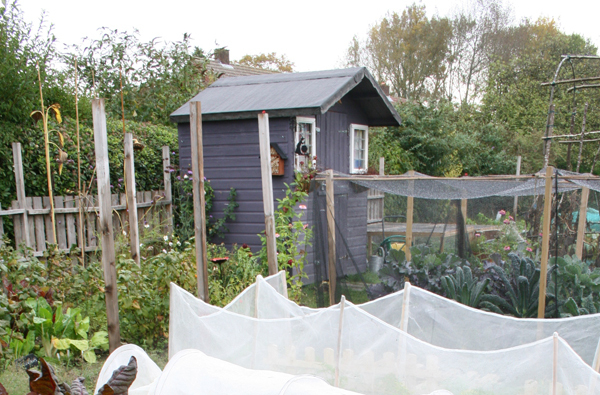 Plot 15C measures 7 metres deep by 13 metres wide and is very much a girls allotment. Taking pride of place is the lavender painted shed complete with a reclaimed windows, a yellow 1950’s kitchen cabinet, a vintage Calor gas oven, patchwork curtains and lots of bunting! There’s a pond, a handmade hazel archway, 3 small vegetable beds and a walk in fruit cage, with plans to keep chickens too. 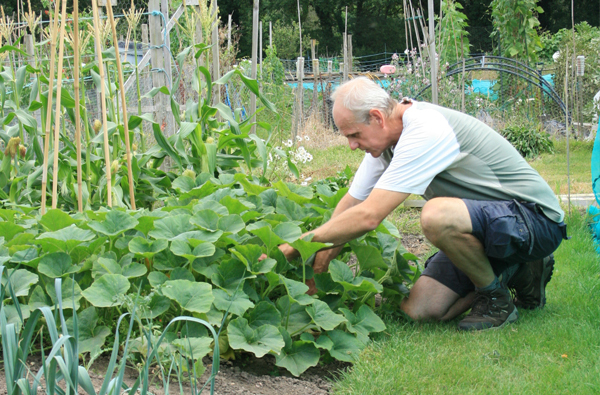 After being on the waiting list for 2 years David first got his allotment in 2011 and that is where you will find him, digging, weeding, sowing seeds and often sitting on his bench sipping tea. He grew up in the same village, in the house that his Father built, surrounded by the smells of homemade jam and elderflower wine. He is a man of all trades, a master at DIY and upcycling. He learnt from his Father and from a young age he would come home from school bearing handmade gifts. When he is not up his allotment he is pottering around in his orange 1972 VW campervan called Florence, a hippy at heart. 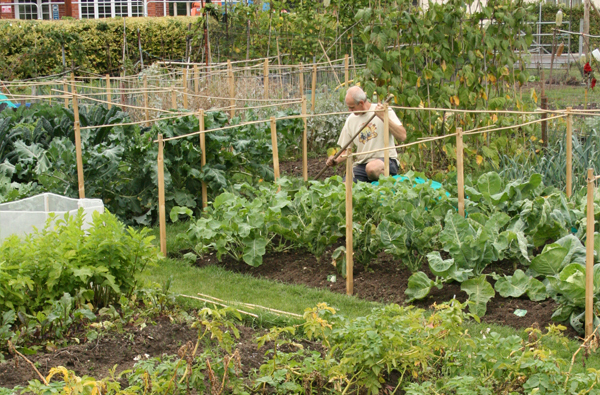 David’s allotment is officially the main vegetable growing plot, it measures roughly 14 metres wide by 15 metres deep. There’s a shed at the far end with a large green house, compost bins, water butts galore and even a bench to sit down and have a well-earned cup of tea. The rest of the plot is divided into 6 large beds which act as a three year rotational plan, roots, legumes and brassicas.